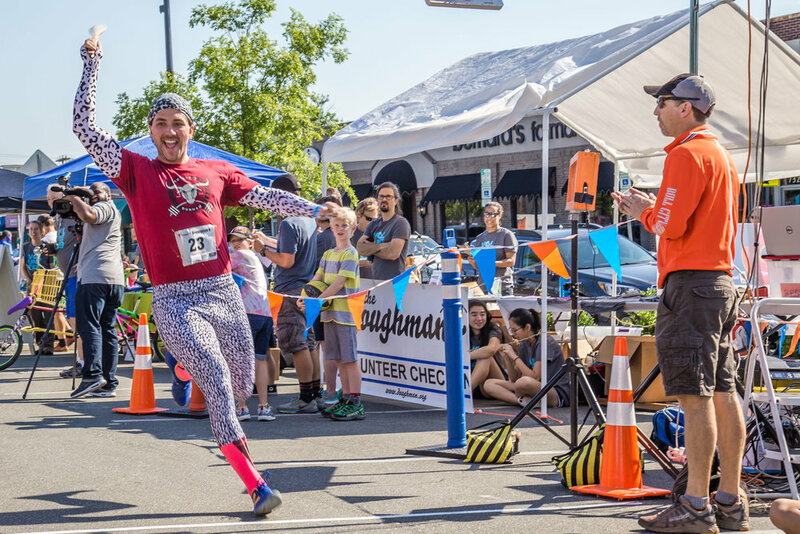 Join us for the 10th DOUGHMAN on May 5th, 2018! Eat then run. Eat then "swim." Eat then bike. Run over the finish line holding hands. 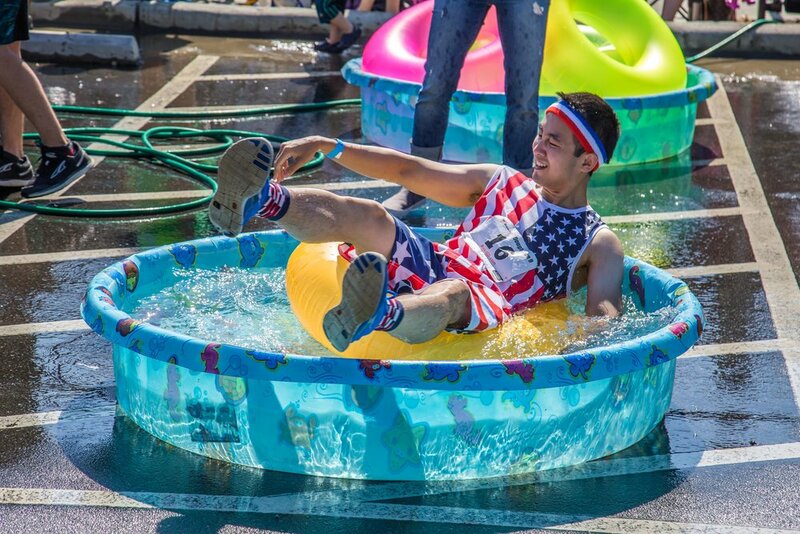 Do you have what it takes to join the ranks of those brave athletes, competitive eaters, and costumed teams who have conquered The DOUGHMAN? Are you ready to chow down on gastronomical challenges from some of Durham's most beloved restaurants before taking a brisk sprint through the beautiful Bull City? Is your stomach growling as you read this? 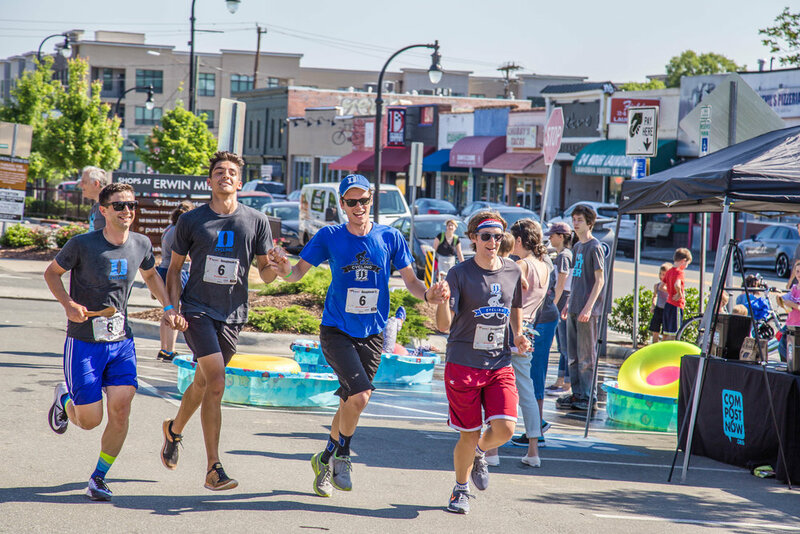 If you've answered yes to any of these questions it's time for you to step up to the challenge that is Durham's legendary gastronomical quadrathlon: The DOUGHMAN! See more photos from our DOUGHy past in our photo gallery! Rules are meant to be broken. Except for ours. Don't break these rules. All racers must be part of a team of four. All racers must be age 18 or older. Each team is required to use a provided LimeBike. No personal bikes allowed. All bike riders must have a helmet. Racers must obey all traffic laws. Vomiting is strictly discouraged (and can earn you a DQ). Please note: As each meal is created in a working restaurant kitchen that uses a variety of ingredients, including nuts, soy, and gluten-based products, we cannot make any accommodations or guarantees for food allergies or sensitivities. Check out our FAQ page for more details. Feel free to blast some techno while reading this section. Read the most recent Herald Sun article here! The News & Observer, Durham Magazine, The Herald Sun, GO: Inflight Magazine of AirTran, The Durham News, Indy Week, TWC News, News 14 Carolina, ABC 11, The Travel Channel, Man v. Food, NBC17, The Monti, Yelp!, Bri Gaal's Blog, Johnstone's Vin Blanc, Bull City Rising, Mouthful, SYNCStudio, Durham Official Visitor Center, OK Great, Urban Durham Realty Blog, Powered by Racephan, Blinkingline, MyNC, The Sports Culture, DEADSPIN, My Magic Bean, Carpe Durham, Mama Marathon, Duke Community Service Center Blog, Get Out! Get Fit!, Trifuel, Bull City Cycling, and Chow. Flywheel Design, sponsor of DOUGHMAN 2009 won a Gold 2010 Triangle ADDY® Award in the Specialty Advertising category for their awesome t-shirt design. They also won a Bronze for the 2009 race poster. Registration is now open DOUGHMAN X.